Lorenzo heads Marquez and Dovizioso as riders turn their focus to race distance during the revealing FP4 session. Free Practice 4 has classically been when riders in the MotoGP™ World Championship look to assess and improve their race pace. The session is the only Free Practice session of the weekend where times do not count towards deciding who enters Q1 or Q2, removing the majority of pressure from the session. For the first time all weekend Jorge Lorenzo (Movistar Yamaha MotoGP) ran without winglets, albeit briefly, while teammate Valentino Rossi (Movistar Yamaha MotoGP) ran with winglets. Strong once again was Jorge Lorenzo as he continued to produce a steady flow of 1’55s as he prepares of Sunday’s race. 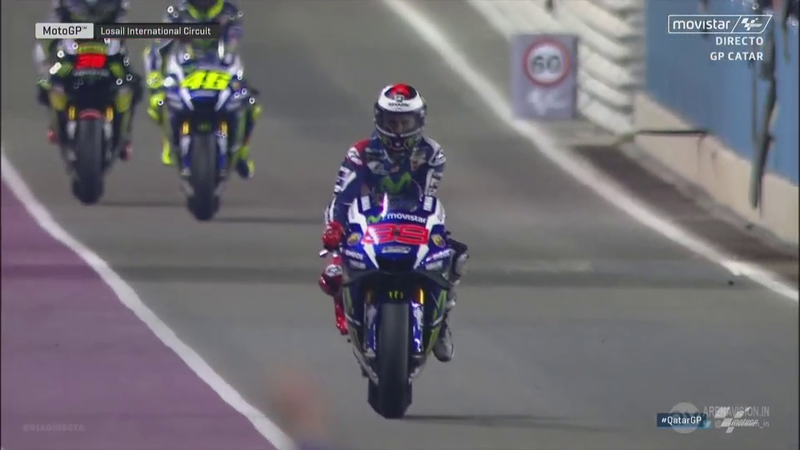 Lorenzo’s 11th lap of the session, with winglets fitted, produced a 1’55.301 to see him on top of the 20 rider field. 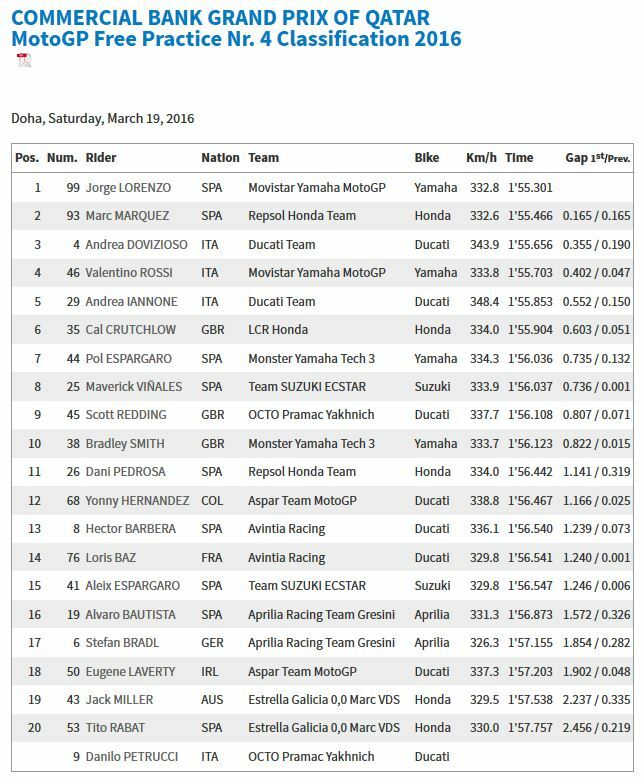 Second in the session was Marc Marquez (Repsol Honda Team) with a 1’55.478. Many of his early problems seem solved as his team reverted several settings to what they were during the Qatar Test. Meanwhile Andrea Dovizioso (Ducati Team) continued to quietly go about his business as he snuck into third, 0.355s off the top spot and 0.190s back on Marquez. After a great race in 2015, ruling the Italian out as a race contender could be a costly mistake for some riders. Fourth was Valentino Rossi who had a small incident with his teammate Lorenzo. 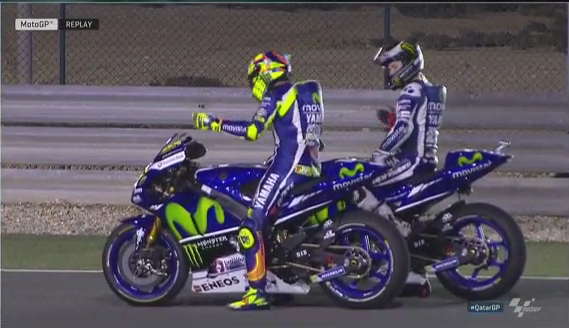 While Rossi was on a fast lap, Lorenzo occupied the inside line and the Italian was forced to sit up. The two discussed the event at the end of the session before their practice starts without consequence. Andrea Iannone (Ducati Team) completed the top five as once again both the factory Ducatis were inside the fastest five riders. Cal Crutchlow (LCR Honda), Pol Espargaro (Monster Yamaha Tech 3), Maverick Viñales (Team Suzuki Ecstar), Scott Redding (Octo Pramac Yakhnich) and Bradley Smith (Monster Yamaha Tech 3) rounded out the top ten. There was an early fall for Jack Miller (Estrella Galicia 0,0 Marc VDS) at Turn 15, the Australian on his feet immediately. Loris Baz (Avintia Racing) fell soon after at Turn 7 and was also unhurt. Further fallers included Scott Redding who slid off at the final corner. Stefan Bradl (Aprilia Racing Team Gresini) crashed at Turn 2 with just over ten minutes remaining.